During a friendly game of tag in 3rd grade, I was tripped by a boy named Keith. There were a gazillion kids chasing each other in the school yard that day, and I was the one person who managed to fall. Wearing a cute little dress and my favorite Winter coat (khaki-colored with creme trim… I loved that lil coat! ), I fell face down on the concrete. My big Urkel-like glasses flew off my little face and landed a few feet away. I could hear a swarm of kids circling around me, and my best friend, Julie, came running to my side. My head hurt and my knees were sore, but I was OK… or so I thought. As I was being helped up, I couldn’t help but notice my blood hugging the cement. Julie picked up my glasses and screamed “part of your brain fell out!! !” I looked at my ginormous glasses and saw something green and bloody smashed on one of the lenses. That’s when I lost it. I began crying uncontrollably and was escorted to the nurse’s office. My cute little coat was now khaki and crimson. My dad picked me up from school and took me to the hospital where the hole in my forehead was stitched shut (and I’m pretty sure they didn’t use anesthesia… it hurt so bad the doctors had to strap me down!!). We caught the bus- yes, public transportation- back home and I went to school for the next week with my forehead bandaged like an Egyptian mummy. Go ahead, you can laugh. From that day forth, I vowed to never run again. I ran away from my fear instead of facing it. I was truly traumatized by that fall! I hated running. Didn’t even like running for the bus! Didn’t even want my nose to run (LOL). I was probably suffering from PTSD or something. It was pretty pathetic. As silly as it sounds, I was scared to death to run! So, what did I do? One day, many years later, I decided to start training for a marathon (’cause that’s what any rational person would do, right? :-D). My girl, Denine, and I both signed up and started training in May 2004. Our endurance was negligible at best. Being one of the world’s most non-athletic individuals, I could barely run a quarter of a mile at that point. But I committed to the training program, running alone 3 days per week and with the training group every Saturday- rain or shine! 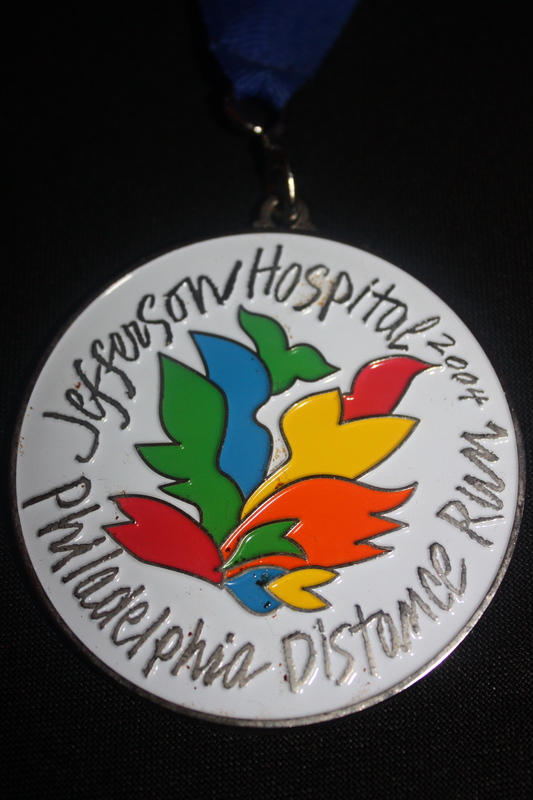 We completed the Philadelphia Distance Run (a half marathon, which is 13.1 miles) in September 2004. I managed to run 10 miles straight without stopping… only because I had to go to the bathroom really bad, and all the port-a-potties I passed were disgusting. So I kept running, hoping to find a half-way decent “facility” (never found one, by the way). By the time I reached the 10th mile, I gave myself a break and started walking (HUGE mistake! It’s hard to start back up once you stop. Momentum is key!). I thought my legs were going to fall off and I’m pretty sure that would have been far less painful… but I managed to cross that finish line anyway. 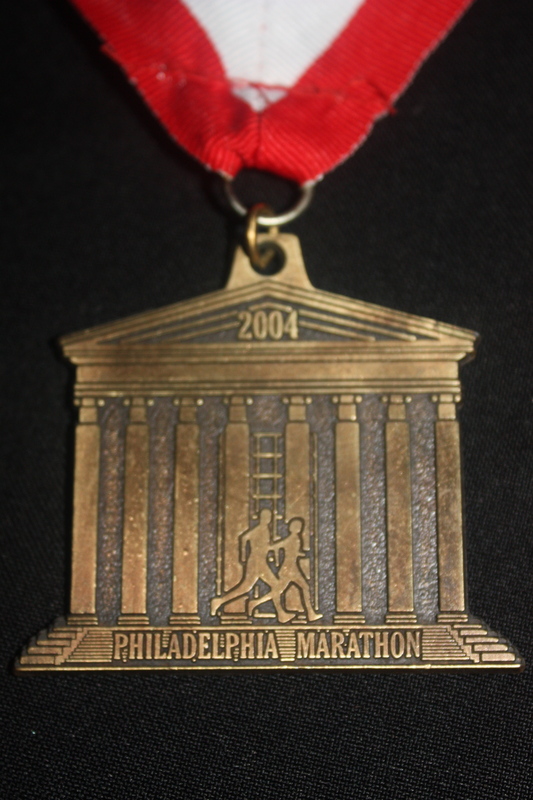 Two months later (November 21, 2004), Denine and I ran the Philly Marathon (the full 26.2 miles). It took me nearly the entire 6 hours allotted to complete the race, but I did it. And Denine recently finished her 2nd half-marathon. God bless her!! There are some folks who run marathons on a regular basis. They can finish a full marathon in less time than it took me to finish the 1/2 marathon. Shoot, there were folks who walked the entire race, and still finished before me! There was even a woman- 7 1/2 months pregnant- who finished before I did! I tip my hat off to them all. My goal was not to win the race (as evidenced by the way I began slacking with my training as the days grew shorter and the weather waxed colder)… I just wanted to face my fears and finish the race. I can not begin to express the sheer excitement, pride, joy, and ultimate satisfaction I felt when I finally crossed that finish line. It is a feeling like no other. To keep pressing forward in spite of your fears, in spite of your pain, and in spite of your flesh begging you to give up ….it was exhilarating (SIDE NOTE: don’t keep going if your heart tells you to stop. I mean that literally and metaphorically. Running a race that’s killing you is not worth it!). And to cross that finish line, knowing that you gave it your all and you finally reached your goal… that’s a blessing in and of itself! When is the last time you faced your fears and challenged yourself beyond your perceived limitations? What fear has paralyzed you from doing more, having more, or being more than you are today? What’s that “one thing” you’ve always wanted to try? What race have you started but failed to finish because the road was too long or too tough? It’s normal to want to give up when times get hard. Your flesh will attempt to dissuade you every time. But when you set your mind to something, train properly, and commit to reaching your goal, then you, too, can cross that finish line of victory. It’s not too late. Have you started 2011 with a list of goals that you have yet to reach? Pick up where you left off, change your thinking (that’s where the training comes in), and start running again. The better you train, the less likely you are to suffer injury when the going gets tough. You can do it with God’s help. “God has not given us the spirit of fear, but of power, and of love, and of a sound mind.” (2 Timothy 1:7). You already have the tools you need to run the race. You just have to put your faith (and your feet) in motion. 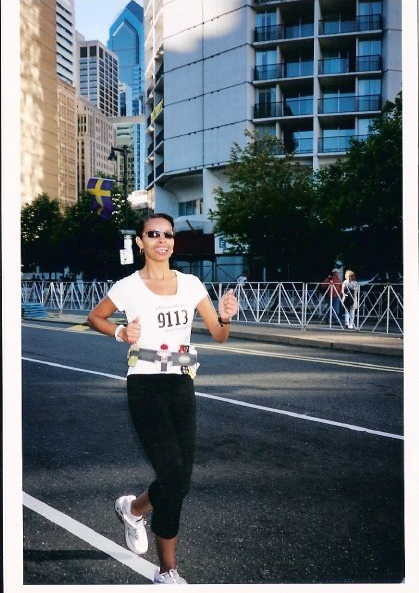 This entry was posted in RANDOMly Me, SPIRITUALly Yours and tagged Facing Your Fears, Finishing the Race, Philly Marathon by The Practical Chick. Bookmark the permalink.